Coming into this X-Files mini-series, I expected aliens, monsters, Mulder the believer, Scully the skeptic and at least one funny episode. What I didn’t expect was how deeply personal some of the episodes would feel. The original run of the show was driven by loss (i.e., Mulder’s search for his missing sister), but the new run has been driven by regret and mature self-reflection. Not that “Home Again” tipped its hand, though, because it starts out like a normal, scary X-Files episode. A U.S. Department of Housing employee named Joseph Cutler is working with a cold-hearted real estate developer to re-locate Philadelphia’s homeless away from skid row to make way for a new high-rise. Of course, Cutler’s pre-credits death is swift and astonishingly brutal as he is literally torn apart by a fly-ridden, barefooted creature which emerges from a ghostly garbage truck, stalks its prey and then returns to a garbage truck with parts of its victim in a trash bag. The creature, later identified as the “Band-Aid Nose Man,” leaves a trail of maggots, bloody band-aids and footless footprints (something Mulder says is impossible) in its wake. Its agenda seems to be a rather literal version of the old campaign promise to head to Capital Hill to “take out the trash.” Whereas aspiring politicians use that expression to imply that they’ll smoke out corruption and vote down competition the “Band-Aid Nose Man” tears humans apart and puts them in the trash, completely ignoring the recycle bin (as Mulder humorously points out while observing the first crime scene). This is an opening scene straight out of a horror movie, with dim lighting, appropriately thudding footsteps from the creature and a tense musical score. “Band-Aid Nose Man” has the slow-and-steady gait of a slasher villain, but when it strikes it does so with alarming strength and in supernatural speed. 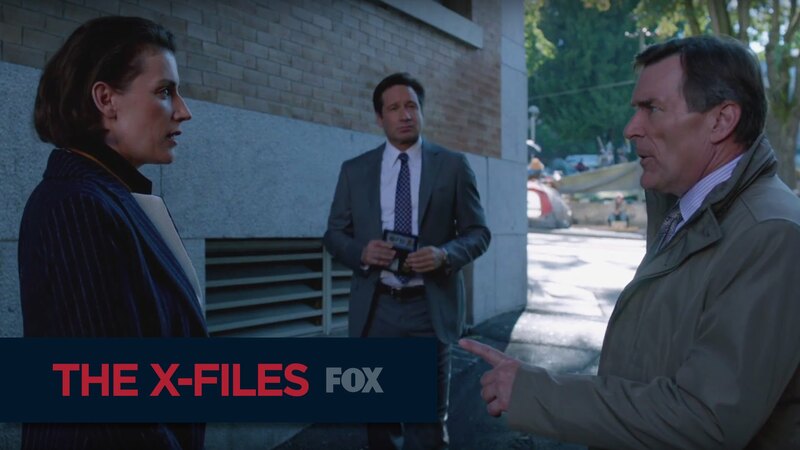 Instantly, this monster feels worthy of a classic X-Files treatment, but the episode quickly throws us a curveball when Scully receives a call at the crime scene informing her that her mother has suffered a massive heart attack and is in the hospital. Suddenly, “Home Again” turns into one of those X-Files episodes where the central duo is split up, Mulder working the case and Scully dealing with family drama. As the “Band-Aid Nose Man” continues to act as a vengeful protector for the homeless, dismembering anyone who would exploit them (i.e., a couple of opportunist art dealers) or treat them like human garbage (i.e., a city council member and a real estate developer), Scully begs her comatose mother not to leave her. The business with the “Band-Aid Nose Man” is suitably horror-movie awesome, but everything with Scully inevitably pulls focus because while it’s obviously bad that these people are all dying we don’t have any real connection with any of them. We recognize that they probably don’t deserve to die, especially not like that, but we’re not especially heartbroken to see them go. As Mulder points out at one point, they’re all simply pursuing their own self-interests and herding the homeless like cattle. However, Glen Morgan desperately wants these two different plots to connect and make sense together, thus leading to some strained, “Don’t you get it? All of this stuff is a metaphor for…” explaining near the end. 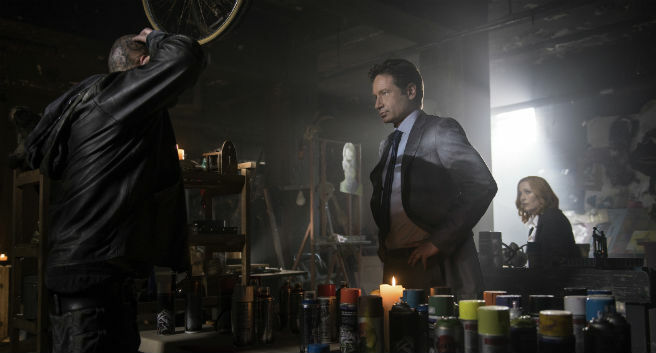 What does a killer trash monster created by a rough analogue for Banksy have to do with the child Scully and Mulder had together and subsequently gave up for adoption? Well, nothing directly, but that doesn’t stop a scattered but emotionally well-meaning episode of The X-Files from working extra hard to create a plausible through line between the two, setting up a situation in which little William (now medium-sized William, probably) is oft referenced in relation to the concept of parents (i.e., creators) taking responsibility for their offspring (i.e., creations). It’s a through line that tries very hard to convince the viewer of its validity, comparing children given up for adoption with estranged sons and, finally, progeny that is willed into existence and emerges from stenciled art pieces to literally rip profit-minded individuals limb from limb. I wish we had another 10 minutes of airtime. I would have liked a few more minutes to kind of let that air out. If we’d had even 10 episodes, and if I had been able to do two episodes out of 10, I would have done the Band-Aid Nose Man and Scully. But we only had six episodes, and we had a lot to accomplish, so you try to do it gracefully in one episode. I wish I had a little bit more time to explore that heartache we go through at the immediate loss of someone. However, for as strained as “Home Again”s through line might be it is ultimately forgivable due to the power of Gillian Anderson’s performance (this is clearly her episode much as “Were-Monster” was Duchovny’s episode) and the raw emotions which emerge in that hospital room. One of the most interesting moments in the episode is simply when Scully watches a crew of orderlies and nurses turn over a deceased patient’s bed, sadly noting how quickly the world moves on. Because it’s The X-Files you might suspect something supernatural is afoot, that perhaps Scully is picking up a clue to something nefarious in the hospital. Instead, it is an honestly observed moment of the quiet end to someone’s life, setting Scully up to ultimately lose her mother even though she’s not at all ready for it. The fact that narrative cohesion demands that this episode must end with Scully using the word “trash” while discussing the way they treated their son is regrettable, but it doesn’t diminish the power of this episode to properly reflect on Scully’s immense sense of loss and regret. 1. “Spooky cases” – Note Mulder’s reaction. He used to be teased as “Spooky Mulder” by his colleagues. 3. X-Files Knowledge or Lack Thereof: I didn’t know that Scully had an estranged brother nor did I know that her mother was still alive (not so much anymore, of course). For some reason, I thought she’d already died. Also, I have never seen any of the William episodes before. I barely knew Mulder and Scully had a kid together. A fantastic review. I agree 100%. The personal aspects of the episode (Mulder slipping back into his quintessential character, Scully dealing with family issues) are beautifully written and well-acted. However, I felt that the “spooky case” component was a bit thrown together at the end and very rushed. Overall, though, a perfect display of Gillian Anderson’s immense talent. Previous Entry Box Office: Is Nicholas Sparks’ Era of Date Night Dominance At an End?